Above: First installation (prototype). Wells, Maine: Size: 96"x174"
Pairing includes: Photogram, Sea Ice, Photograph, Sveabreen Glacier, Svalbard. 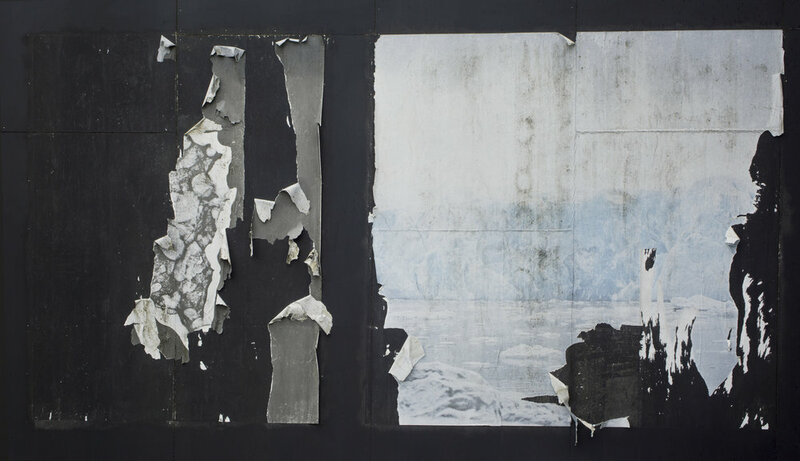 Murals are installed with the inevitable deterioration process in mind. Above photographs taken nine months apart. As we close out 2017 and begin 2018 with extreme cold temperatures here in Maine, I'd love to share these beautiful soundwalks by Josephine Holtzman and Isaac Kestenbaum. We invite you to bundle up and take a few minutes to listen, walk, remember and experience the outside world. Everywhere: The Walk is produced by Josephine Holtzman and Isaac Kestenbaum as part of the project Winters Past. Funded by Invoking the Pause, an environmental small grants program designed to advance public awareness and engagement about climate change issues. Everywhere: The Pond is produced by Josephine Holtzman and Isaac Kestenbaum as part of the project Winters Past. Funded by Invoking the Pause, an environmental small grants program designed to advance public awareness and engagement about climate change issues. Video and audio captured in Svalbard, Norway during a three-week Arctic Circle Residency. Audio by Shoshannah White and Tyler Jones. Video and editing by Shoshannah White. Glasstire highlights 10 walking artists. Closer to home, previous Kindling Fund Grantee Julie Poitras Santos created Platform Projects, a wonderfull and exciting public initiative related to walking, nature and art practice.